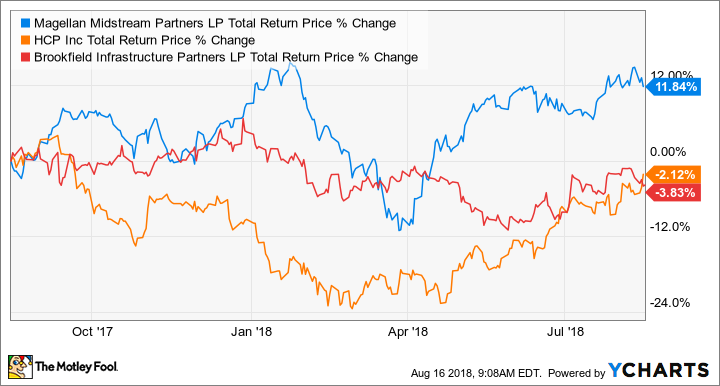 Magellan Midstream Partners, HCP Inc., and Brookfield Infrastructure Partners look like great retirement stocks. Retirement today is a whole different ballgame than it was a few decades ago. Not only are people living longer, fewer and fewer people have defined benefit plans (think pensions) and are relying on their savings plans such as 401ks, IRAs, and other savings. No one wants to live through retirement trying to stretch every dollar as far as possible, but drawing down savings too quickly could be disastrous down the road. One way to balance the needs of income and preserving your nest egg is to invest in stocks that can pay a consistent and growing dividend. Using dividend payouts as an income stream leaves your principle intact and gives it a chance to grow over time. The trick is finding top-shelf dividend stocks that will deliver for decades to come. Three stocks that have this quality are pipeline master limited partnership Magellan Midstream Partners (NYSE:MMP), healthcare real estate investment trust HCP Inc. (NYSE:HCP), and alternative asset manager Brookfield Infrastructure Partners (NYSE:BIP). Here's why you should consider these three for your retirement. You'll be hard-pressed to find a company that has delivered consistent results and high payouts to investors as well as Magellan Midstream Partners. The company's network of crude oil and refined petroleum product pipelines and storage facilities -- and the contracts customers have signed to use these assets -- have supported a distribution that has grown every quarter since Magellan went public in 2001, increasing at an annual rate of 12%. Part of the reason that Magellan has been able to generate such consistent results is that several of its refined product pipelines are treated like regulated utilities. Several portions of its refined pipeline business are in what the Federal Energy Regulatory Commission has deemed uncompetitive regions. Basically, Magellan's pipelines are the only way to economically deliver product to these parts of the country. Therefore, those portions of the pipes have indexed pricing models that guarantee a certain rate of return like a regulated electric utility. On top of this incredibly stable business, Magellan's management has done an incredible job of identifying new assets -- either through construction or acquisition -- that can generate high rates of return and support he company's growing payout. Today, the company has over $2 billion in projects in the works, such as crude oil export terminals and pipelines to deliver oil and gas from the Permian Basin to the Gulf Coast region. Management has said that its payout growth will slow down a bit because it is investing so heavily right now, but it still expects to deliver payout growth of 5% to 8% over the next few years. Magellan has been a great investment for people looking for a reliable and growing payout, and there's little reason to believe that can't continue. A few years ago, the three largest concerns for HCP were its exposure to skilled nursing and post-acute care centers, a concentrated customer base, and a debt level that made investors squirm in their seats. So instead of trying to limp along with these issues, management took on the challenge by spinning off its skilled nursing facilities and structured an exchange of assets with its largest tenant. These moves freed up lots of cash that management has used to trim some debt and to reinvest in more attractive properties such as life sciences and medical offices. Despite the short-term speed bumps associated with HCP's reconfiguring of its portfolio, the opportunity in healthcare facilities is enormous, supported by an aging population and the expected boom in healthcare spending to meet the needs of this demographic. With its high dividend yield today and the growth potential in healthcare, HCP could be a great retirement stock. There are lots of reasons why Brookfield Infrastructure Partners makes a great income investment. It has a diverse set of assets including toll roads, water treatment, electric transmission, and natural gas pipelines across the globe. Having assets in a wide variety of industries and geographies means that weakness in any one business segment isn't going to put the company's entire business at risk. It also so happens that almost all of the assets Brookfield operates come with long-term, fee-based contracts that make the company's revenue and cash flow stream relatively easy to predict. A lot of companies operate in these business segments, though, and there isn't anything that special about Brookfield's infrastructure investments compared to other companies out there. What truly separates Brookfield from the rest is the management team and its approach to capital allocation and portfolio management. The fastest way to destroy shareholder value in this business is by overpaying for assets or by financing those assets at expensive rates. By searching out distressed assets where it doesn't have to outbid others and using a portion of its cash flow as a funding source, the company has been able to amass this diverse set of assets that have generated high rates of return and grow its payout 12% annually since its IPO. Investing in great assets that can throw off lots of cash is a great way to supplement one's income in retirement. Investing in a company with those traits and a great track record of being a great steward of shareholder capital like Brookfield Infrastructure Partners is a way to get income and wealth generation in your golden years.